The U.S. stock-market rout is cooling an investment product that has been one of the decade’s hottest. U.S.-listed exchange-traded products logged outflows of more than $6.6 billion in the week ended Feb. 5, according to data provider FactSet. The bulk of the outflows have come from U.S. stock-tracking funds, the assets of which make up more than half of the $1.9 trillion in exchange-traded products in the U.S. Exchange-traded funds hold multiple securities like a mutual fund but trade on an exchange like a stock. The outflows are a challenge to asset managers who offer exchange-traded funds, which had been a bright spot as investors sought low-cost investing tools in recent years. Inflows last year fell short of their 2014 record, and the latest stock-market swoon could further crimp inflows into the funds just as ETF issuers are trying to court jittery investors with new products. Exchange-traded funds are “certainly not immune” to the downturn, said Ben Johnson, who heads ETF research at mutual fund analysis firm Morningstar. 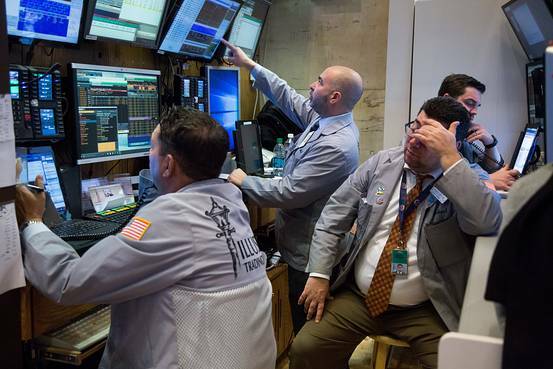 Last month, as the S&P 500 fell 5.1%, investors pulled more than $11 billion from exchange-traded products that track U.S. stocks, dragging down monthly inflows for all U.S. exchange-traded products to $348 million, the smallest monthly increase in 12 months, according to FactSet. Exchange-traded products have grown sharply in recent years, with assets nearly doubling since 2010. They even gathered new investor money during the financial crisis, according to FactSet data, and investors added a net $2.7 billion to the products in August. That month, products holding U.S. stocks experienced outflows as the S&P 500 posted its biggest monthly decline since May 2012 amid worries about China’s economy. Concerns have intensified since then, however, said Monish Shah, head of ETF trading at Mizuho Securities USA Inc.
“August was just the start” said Mr. Shah. Investors’ caution has created some bright spots among the products. U.S. fixed-income exchange-traded products brought in $13 billion last month and $2.1 billion in the first week of February, according to FactSet. Investors have been seeking assets perceived as safer than stocks such as U.S. government debt and gold.